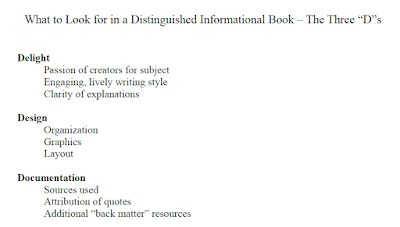 I’m so excited that Melody Allen, a retired librarian who served on the 2007 Sibert Medal committee, has agreed to share the kid-friendly guidelines she developed for evaluating nonfiction books based on the ALA’s official criteria. They are perfect for the Sibert Smackdown and other Mock Sibert programs. Thank you, Melody. 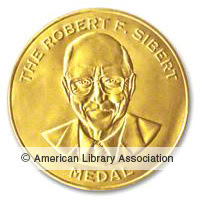 When I was on the Sibert Medal committee, I read many, many informational books aimed at children through age 13. Since I did not work directly with children at the time, I felt it was important to see how young people would respond to books that impressed me. I met with a fifth grade class over a four month period, outlining the criteria for the award and listening to the students’ reactions to the books. At the final session, the kids enjoyed voting for their winners. Over the next few weeks, I’ll be sharing posts that describe The Three "D"s in detail. Today, I’ll start with Delight, which has three components. —Was the book a satisfying reading experience, increasing your interest and expanding your knowledge of the subject? —Was the language used vivid, clear, and readable? —Were you drawn into the book by questions, dramatic moments, and connections to information and experiences familiar to you? —Was the information presented so that you felt like a fellow researcher/explorer/scientist/creative artist/etc. on an exciting journey of discovery? —Could you sense the author’s enthusiasm for the topic? —Remember that the illustrator as well as the author is recognized by the award. Did you enjoy the visual impact of the book? Next week, I’ll be discussing the second "D"—Design. 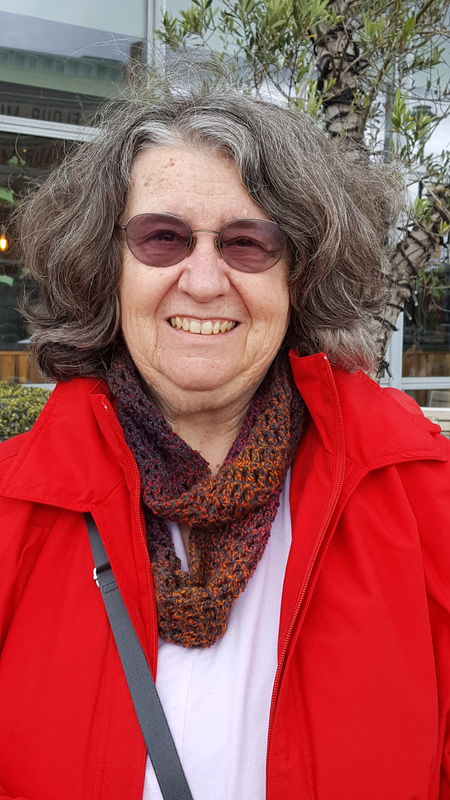 Melody Lloyd Allen is a retired librarian who worked in public libraries and schools, and for 30 years, as the state children’s services consultant in Rhode Island. She also taught at the Graduate School of Library and Information Studies at the University of Rhode Island, the Graduate School of Library and Information Science at Simmons College, and the Center for the Study of Children’s Literature at Simmons College. She served on the Caldecott Medal Committee twice and once on the Sibert Medal Committee. Thanks for your insights into the evaluation process! It must be so hard to narrow them down. 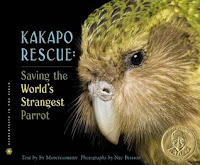 There are so many excellent nonfiction books to choose from these days! Definitely the hardest part of the process - trying to select one winning book. I love hearing how you involved kids in your process. Kids are so honest in their opinions but need help to go from "yuck" or "love it" to expressing why they had that reaction. 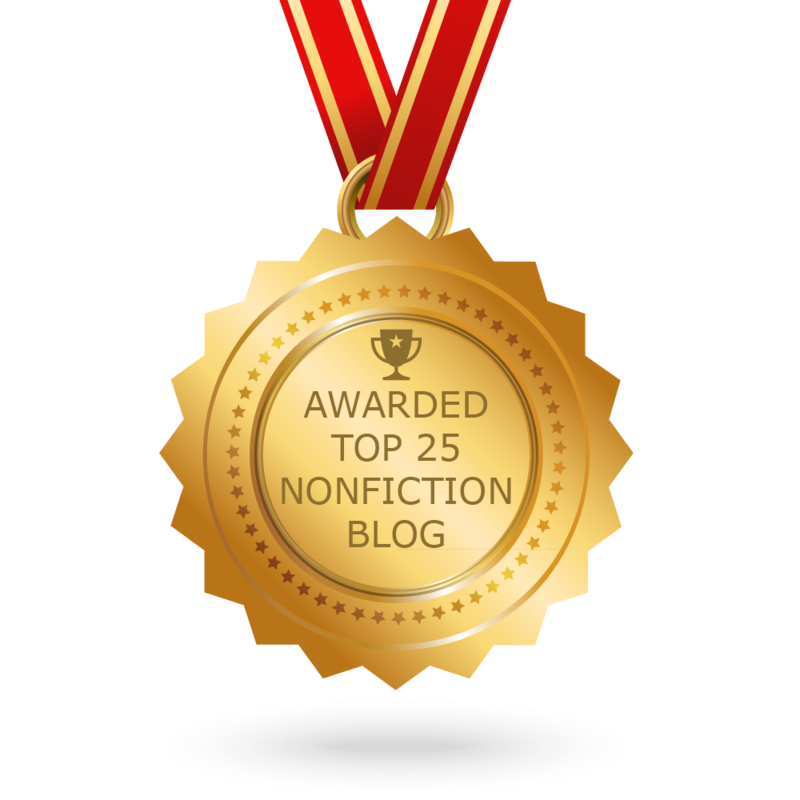 This is an interesting series and will help us authors as we write future NF books. Thank you!